Terry and I first discovered Greek lemon soup at a local restaurant in Gilroy shortly after we moved there. We thoroughly enjoyed it, but it’s not a soup you come across every day. So when Terry suggested making the soup for a Sunday dinner I was more than agreeable. I printed out three recipes, each somewhat different from the other. 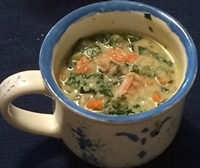 Terry selected a recipe from Cooking Light, lemony Greek chicken soup. I left it to her to do the cooking since she knew what she wanted. She followed the recipe pretty closely. The recipe included carrots, spinach, orzo, red pepper, and stock. I bought a package of cooked pollo asado from the refrigerator case for the chicken. I thought the result was quite tasty. Terry found it a bit too thick for what she wanted. We’ll try another recipe for a more broth-like consistency, but this one held up quite nicely in its own right.